After decades and decades of stories within superhero and sci-fi franchises, it can sometimes feel like there are no new good ideas. 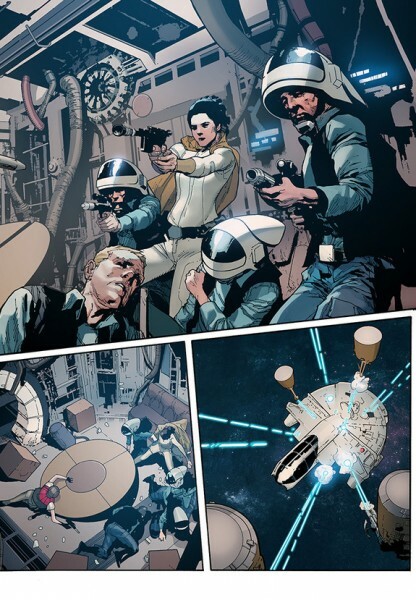 So I give credit to Jason Aaron for Star Wars #16, which is the first story in an arc that focuses on what happens to Empire prisoners that the Rebel Alliance catches in the midst of battle. I haven’t read extended universe Star Wars novels, so it’s possible this idea has been covered previously, but it is the first time I’ve seen this premise, and it’s pretty ingenious. Additionally, Aaron adds some strong ethical debate to the issue. 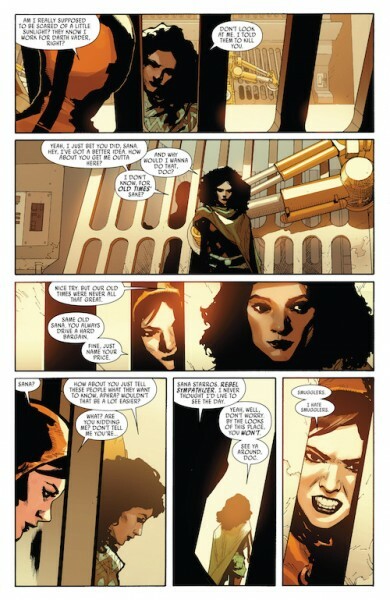 Following Sana Starros' claims that she was Han Solo’s wife (which turned out to be not true), Sana, herself a smuggler, has joined up with Princess Leia -- for a fee -- to transport Dr. Aphra, a special Empire weapon specialist, to the secret Rebel prison known as Sunspot Prison. While there, Leia and Sana debate what to do with Dr. Aphra. Sunspot Prison is supposed to be unknown and impenetrable, but what happens by the end of Star Wars #16? That’s right, it’s boarded by a force of Empire-aligned warriors, led by an unidentified soldier. As I mentioned, I find the idea of a jail for prisoners from the Empire really interesting because there had to have been a lot of them in all of the battles fought between the Empire and the Rebels. Sunspot Prison also isn’t just for your average Stormtrooper, but rather very dangerous and very desirable targets. It makes sense that you would want a really secure facility for people like that. Having the prison on a sun-like star is a cool visual, and though we are told that it is super secure, one of the first things that happens after its introduction is it being raided. So it’s not really all that impressive introduction to the Rebel’s best prison facility. Another element of Star Wars #16 that works well for me is the debate that occurs while at the prison between Sana and Leia about Dr. Aphra. As expected, Leia believes that Aphra should be imprisoned because she could eventually yield useful intel. Sana, on the other hand, believes that Aphra would never break and that she’s too dangerous to keep alive. It’s tough talk from Sana, though I wonder if it was her job to off Dr. Aphra, whether she would be so definitive. Still, it’s a well-staged ethical debate about what to do with really dangerous captured individuals. It has parallels in superhero comics (such as the “should Batman just kill Joker” debate) and even in the real world when comes to terrorists or mass murderers. 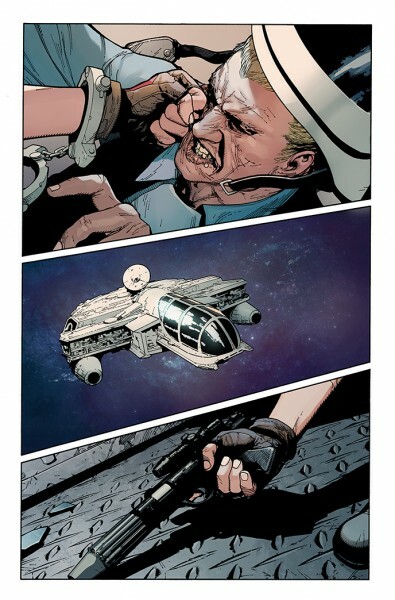 While many elements of Star Wars #16 were successful, the art was more of a mixed bag. I was nervous when I saw that the issue would be drawn by Leinil Yu, whose art has frequently frustrated me in the past. Yu seems to have toned down a lot of the scratchiness that plagues his art about 4-5 years ago. His rendering of Leia is actually pretty solid. He also draws a number of impressive space scenes. However, in many panels, there is something lifeless about his characters’ faces. When he gets to draw creatures or people in masks, it’s not so much of a problem, but the scenes with Luke Skywalker and Han Solo are not especially dynamic. The arc that begins in Star Wars #16 is called “Rebel Jail.” While that name is rather on the nose, I can’t really fault Aaron or the book’s editors for choosing a self-evident name. It’s also a potentially intriguing inversion since many prison break stories make readers care about those escaping. Would Aaron try to make readers root for characters to break out of the Rebel Alliance’s jail? There are a number of directions this storyline could go, so it’s a premise that should be worth following.